Budget airline Monarch has received a temporary extension to its licence to sell package holidays. The company also said it had secured additional funds from shareholders and was close to announcing its biggest ever investment. The news came just ahead of a midnight deadline for the renewal of its Civil Aviation Authority (CAA) licence. 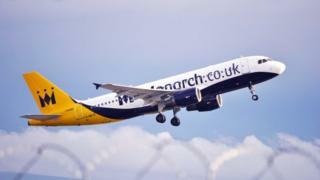 Last weekend Monarch was forced to deny “negative speculation” about its financial health. It has struggled under intense competition and a fall in demand for holidays in Turkey and Egypt. A Monarch spokesman told the BBC that all flights on Saturday were flying as normal. The company operates 130-140 outbound and inbound flights a day, and passengers had been expressing concern on social media about whether all those flights would take place. There are more than 100,000 Monarch holiday-makers overseas at the moment. The airline employs about 2,800 staff and is based at Luton Airport. The 12-day reprieve has been welcomed by Brian Strutton, general secretary of the pilots’ union Balpa, who said the uncertainty had been lifted “which is good news for the pilots, crew, staff and customers”. Monarch is protected by the CAA’s Air Travel Organisers’ Licensing (Atol) scheme – the scheme that refunds customers if a travel firm collapses, and ensures they are not stranded. But for the licence to be renewed, allowing Monarch to continue to sell package holidays, the company had to prove it was financially robust. The company has been majority owned by Greybull Capital since 2014, when the investment firm bought a 90% stake in the airline. Greybull has now put extra funds into the airline, enabling the CAA to grant a temporary extension to the airline’s licence until 12 October. By that time Monarch is confident it will have secured the “largest investment in its 48-year history”. Chief executive Andrew Swaffield said he was “excited about the additional capital coming into the group which will help us fund our future growth”. It is believed that some of the money will be used to proceed with an order for 30 Boeing aircraft. In its statement, the CAA said it was able to extend the licence “by requiring the shareholder to provide additional funding and because customers’ money will be protected”. “Monarch now has 12 days to satisfy the CAA that the group is able to meet the requirements for a full Atol licence. Monarch says Atol offers consumers security “where a flight and accommodation have been booked together, some flights booked separately and applies in certain other circumstances”. Earlier this year Greybull bought a division of Tata Steel, as well as 140 M Local convenience stores from Morrisons, which subsequently went into administration. A former managing director of Monarch, Tim Jeans, told BBC Breakfast the company had been having difficulties for some time. “They certainly have to come up with the money and the investment to satisfy the CAA in those 12 days, otherwise the future does look rather bleak. And the Independent’s travel editor Simon Calder told the BBC that Monarch was a “much smaller and less agile” operation than the giants of low-cost aviation, Ryanair and Easyjet.